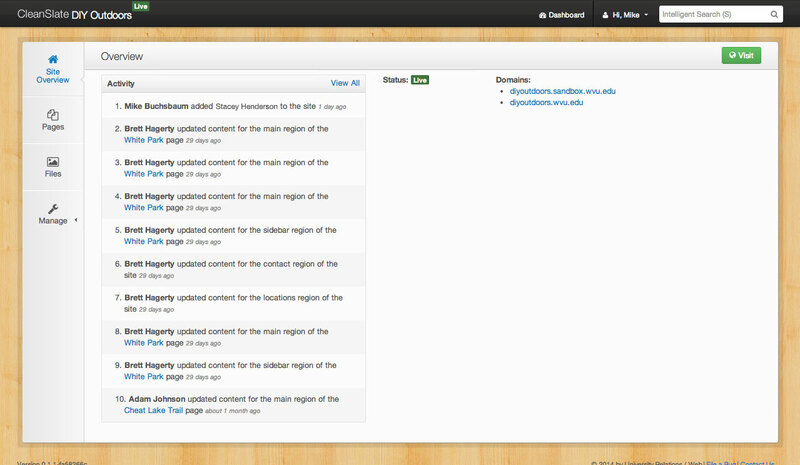 A content management system made for West Virginia University. One system, all your sites. CleanSlate is one Content Management System to manage all of your sites. It’s easy to log in because it uses your WVU Login credentials so you won’t forget your username or password. Once you’re logged in, you can choose a site to edit and seamlessly switch between your sites. Edit your site in the context of your design. Our goal is to make CleanSlate as easy and seamless as posting things to Facebook. Just log in, choose your site and page, and click the text to edit. Once you’re finished, hit publish and your changes are live on the web. Read more about publishing your content. Give different people access to your site using roles. Site administrators can choose who can edit, publish, and do administrative tasks on your site. Want to give access to a student but don’t want them publishing content? No problem. Want to give access to a faculty member? No problem. Learn more about user roles. Simple yet powerful asset management. CleanSlate allows you to upload any number of files to your site as long as each individual file is less than 50mb. You can add labels to sort and filter your files and add metadata like title and description to each of your files. Powerful filtering is built in to the system. Learn more about files. The CleanSlate user interface has been built to work on any modern mobile device. The interface is responsive and you can log in and perform a variety of tasks whenever you’re away from your desktop computer. Edit page and file metadata on an individual level. Change the title of your page or add a meta description to pages that need to be summarized for popular search engines. CleanSlate theme templates are completely customizable too, so you can tailor it to your needs for better SEO. Made for you, the user. We’ve made CleanSlate for you, the end user. Our goal is to simplify complex tasks to help you make and manage a more effective website. Our decisions are based on years of user interface and design experience. We also follow best practices from the industry to give you a better experience. Easy to understand, flexible templating. Themes and templates in CleanSlate are super easy to understand. Our page templates use HTML and a language called Radius to do things you’ve come to expect from CMS templates. If you understand HTML, you’ll understand templates in CleanSlate. Learn more about making themes and templates for CleanSlate. We use the best tech. CleanSlate is a Ruby on Rails based CMS. Under the hood we use Bootstrap, Sass, CoffeeScript, jQuery and KnockoutJS to power the app. We follow modern application strategies to keep our code portable, modular and fast. Development is done on Github in a private repo. Request to have CleanSlate open sourced. Contact your college’s web designer to talk about CleanSlate. If you already have a site in SlateCMS, you’ll have to get a site set up in CleanSlate and manually migrate your content. Your college’s web designer can help outline a plan for you to get your site in CleanSlate based on everyone's needs and timeframe. Are you a designer at WVU and want to get a site in CleanSlate? Check out our developer documentation. If you’re ready to build a site, email us and we’ll get you set up to build your next masterpiece. Want to use CleanSlate but aren’t part of WVU? Let us know! © 2019 West Virginia University. WVU is an EEO/Affirmative Action employer — Minority/Female/Disability/Veteran. Last updated on May 3, 2016.